Welcome to my web site! Feel free to explore. Mr. Strong is having surger today, so I will be subbing Tuesday and Wednesday before break. My mission is to encourage curiosity, promote achievement, and demonstrate integrity through the learning of young adults. rates, time, and total output. "I've come to the frighteing conclusion that I am the decisive element in the classroom. Its' my personal approach that creates the climate. It's my daily mood that makes the weather. As a teacher I possess a tremendous power to make a child's life miserable or joyous. I can be a tool of torture or an instrument of inspiration. I can humiliate or humor, hurt or heal. In all situations, it is my response that decides whether a crises will be escalated or de-escalated and a child humanized or de-humanized." 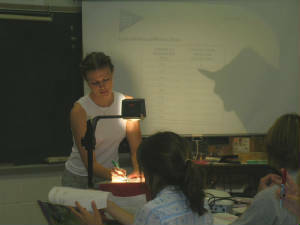 While some lessons at Ithaca High School seemed to be best taught through lecture (see above), others were best uderstood through active learning (see left and below). 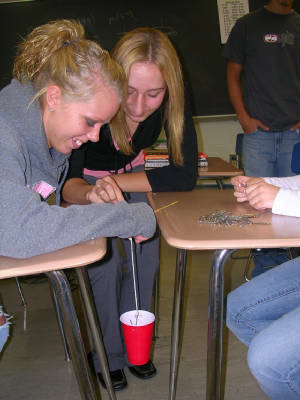 Students work together exploring the relationship between the length of a "bridge," the thickness of the bridge, and the weight it can hold before breaking. This is a working web site and it will be modified frequently. Be sure to check for updates and new information.